I feel super proud of this week’s breakfast recipe because I made it up myself! I’m not claiming that I thought of this first, I’m simply saying that the idea came to me as a stroke of genius, and I didn’t do ANY recipe research! 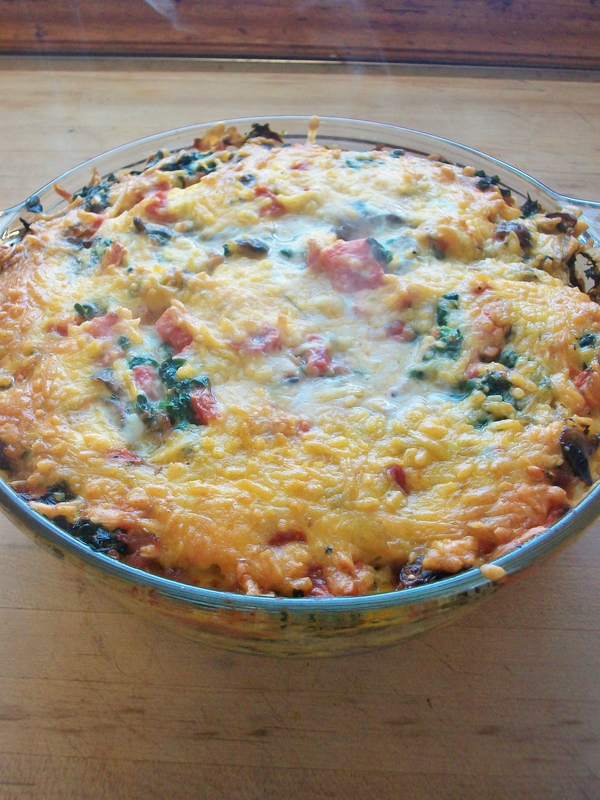 Grease a two-quart casserole dish and preheat the oven to 375 degrees. Begin the lasagna with a thin layer of shredded hashbrowns in the bottom of the dish. Add another layer of hashbrowns and repeat other layers twice (you will not use the entire bag of hashbrowns). Add the last layer of cheese before slowly pouring beaten eggs over all. Allow to sink through the layers before cooking in a 375* oven for an hour, until eggs are set. This turned out delicious thought it took forever to cook (speed it up by only making two layers in a more shallow pan). Obviously, it didn’t stay in firm layers like real lasagna, but it was still a fun twist on class breakfast bake ingredients. I can’t want to make it again in the summer with garden tomatoes and perhaps zucchini instead of spinach. I’d also like to mix it up and add bacon instead of sausage. Oh, the possibilities! Posted in BreakfastTagged breakfast, brunch, eggs, food, hashbrowns, lasagna, mushrooms, sausage, spinach, tomatoesBookmark the permalink.